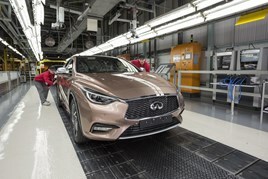 Nissan’s premium sister brand Infiniti has begun production this week of the Q30 executive hatchback at the Japanese group’s assembly plant in Sunderland. It follows a £250 million investment in newly-built facilities at the Sunderland site that has created 300 jobs. The Q30 is the brand’s first vehicle to be manufactured in Europe, to be followed by the QX30 compact crossover (gallery below) next year, and it will be for export markets as well as the UK. As part of its global growth plan, Infiniti vehicles are now built in five assembly plants on three continents. Trevor Mann, Nissan Motor Corporation’s chief performance officer, said: “Today we are beginning an exciting new chapter in the Infiniti story, and I can’t think of a better place to start than here at Nissan’s Sunderland plant. Roland Krueger, president of Infiniti Motor Company, said: “Q30comes at a moment of significant opportunity for Infiniti. Following a period of record global sales, we are entering a new segment with the Q30. Instrumental in the development of the Infiniti Q30 were the brand’s European design and technical centres in Paddington and Cranfield, UK respectively. With an expanding network of Infiniti dealerships and authorised repair workshops in the UK, the introduction of Q30 manufacturing in Sunderland demonstrates the brand’s strong commitment to the UK, he said.